If you've followed me for a while, you mostly likely know that I'm a big fan of paper planners and notebooks and such. However, I haven't talked much about one of my most favorite journals I keep--my reading journal. Now I know what many of you are going to say--why have a journal when you have Goodreads, which is so easy? I'm a huge fan of Goodreads as well and keep track of all my books there. I love doing their annual reading challenge. However, Goodreads is very public. You have to think about your reviews, craft them to be read by others, respond to comments, etc. That's can be a fun thing to do, but it's a different kind of reviewing. It's reviewing for others' benefit, which is great, but what about for your own benefit? Then, at the end of the year, it's so satisfying to flip through the pages and see all the books I've read and track the year that way. 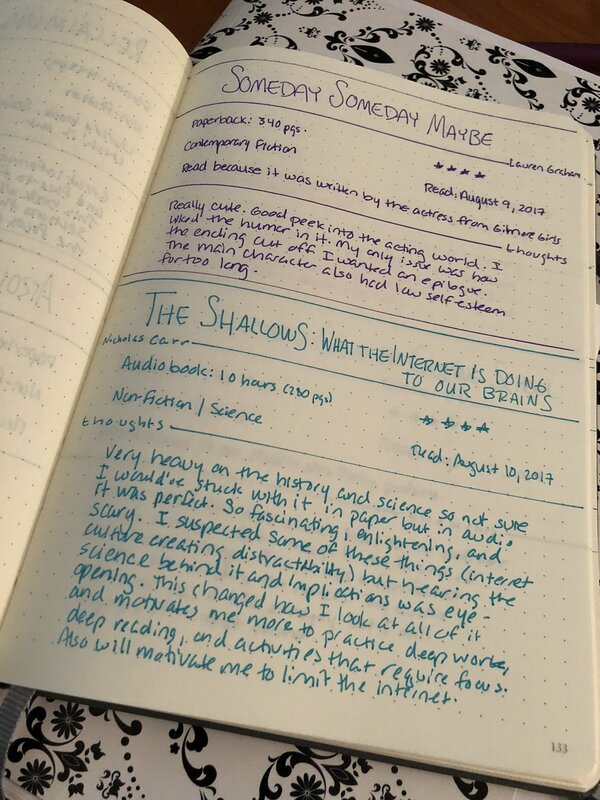 It's a great keepsake, and really, I'm already in year 3 in the same journal, so you can get a lot of mileage out of one nice journal. 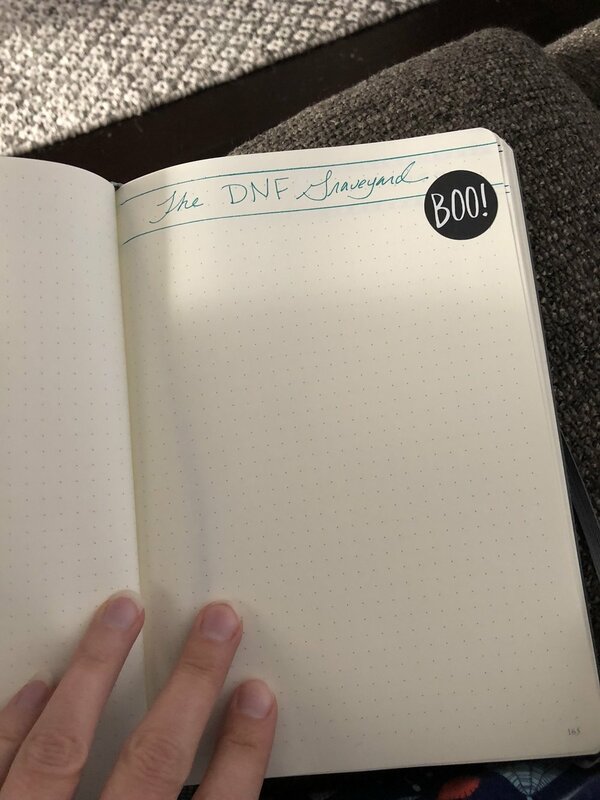 I also record movies I've watched, TV series I've completed, and I keep a page for DNFs (did not finish) books. You can add whatever you want. So, I encourage you to give one a try for 2018! 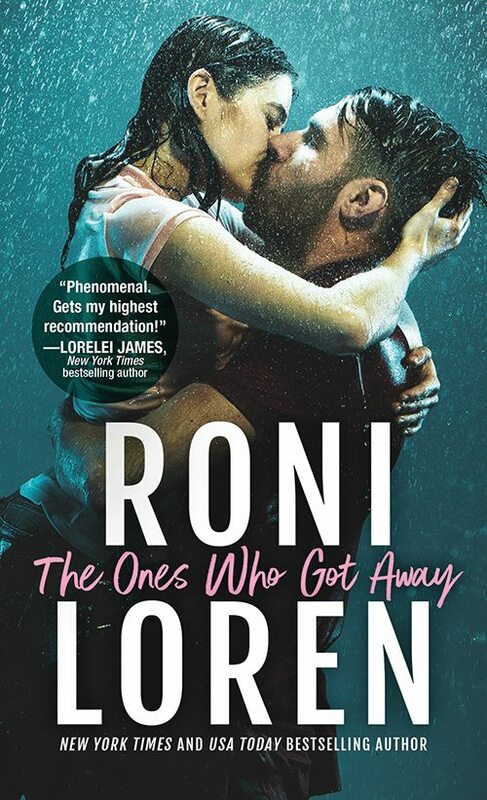 Below I'm going to show you mine and tell you the products I use, but if you want an easy, pre-made printable for your reading journal, just sign up for my newsletter and you'll get a free romance reading journal download emailed straight to you! Don't want to make your own? Download my free printable reading journal! 1. Create a title page. This isn't necessary but since I keep more than one year in a journal, I like to mark the start of a new year with a title page. I went simple with stickers this year. 2. Create a master list in the front because it's fun to get a quick at-a-glance overview. Leave yourself a few blank pages if you're a heavy reader. (If you run out of space, you can always "thread" the list by writing on the bottom "continued on page 123) and then finish your list there. I usually leave two pages for this. And you can get as fancy as you want with lettering or design, but my drawing skills are limited so I keep it simple and clean. 3. Decide what extra pages or lists you want to keep and add those. 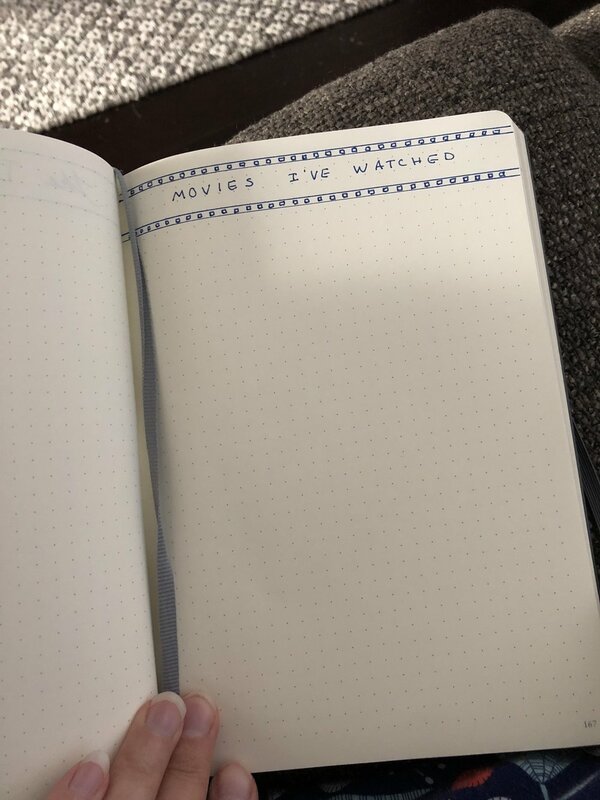 I like to include a list of movies I've watched, TV series I've completed, and books I DNFed (did not finish.) On the DNF list, instead of doing a full review, I just make a note of why I didn't finish it. On the movie list, I usually put a one line comment about if I liked it or not. 4. Decide on a review format that works for you. This is where you can get creative. What do you want to record about a book? What details are important to you. You can go as simple or as elaborate as you want. Just make sure that whatever you choose, it's going to be easy for you to stick with. If you're going to do all out calligraphy on every review and draw pictures and add watercolor, you're probably not going to stick with recording every book. Make it EASY for you to use. Space for my thoughts on the book. It's sounds like a lot, but it's not at all. It comes out looking like this and usually I can fit two reviews per page. I use the thick bookmark to make the lines and I use pretty colored pens to make it interesting. And that's it. That's the extent of the set up. Really easy and simple. I know it's simple because I've never stuck with any journal in my life for 3 years and I have with this one. I've capture every single book I've read since I started it. I love it. 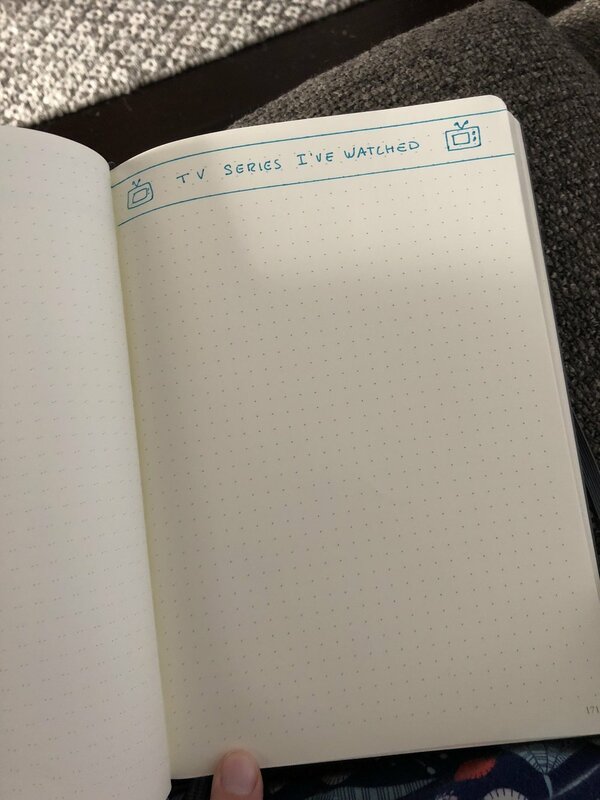 So, I'm curious, do any of you have a private reading journal? Anyone hoping to start one?